IMPORTANT – This End User License Agreement (“EULA“) is a legal agreement between you (“you” or the “Authorized User“), in your capacity as an authorized user (individually or on behalf of your company (the “Company“)), and CashStar Inc. (“we” or “CashStar“). Before accessing or using any part of any CashStar websites, platform, API, or other related services, portals, or tools, or any of the materials, software, documentation, and content available in or through them (collectively, the “CashStar Online Services“), you should carefully read the following terms and conditions contained in this EULA, as they are a material condition to your access to and use of the CashStar Online Services. If you do not agree with this EULA, or you are not an authorized user, you are not granted a license or permission to access or otherwise use any of the CashStar Online Services. We may change the terms of the EULA, so please check back from time to time. By continuing to use the CashStar Online Services, you agree to be bound by the EULA as modified. All changes are effective when posted and apply to your access and use of the CashStar Online services thereafter. LICENSE GRANT. The CashStar Online Services are provided by CashStar, and this EULA provides you with a personal, revocable, limited, non-exclusive, royalty-free, non-transferable license to use the CashStar Online Services, which at all times is conditioned on your compliance with the terms and conditions of this EULA. Your use of the CashStar Online Services is subject to the obligations and restrictions set forth in this EULA. USER OBLIGATIONS. You represent that you are at least the legal age of majority, that you are an authorized user (individually or have been duly authorized to act on behalf of the Company, if applicable) each time you use the CashStar Online Services, and that you will, at all times, provide true, accurate, current, and complete information when submitting information or materials on the CashStar Online Services, at registration or otherwise. We do not guarantee that the CashStar Online Services are accessible on any particular equipment or device or with any particular software or service plan. You agree to abide by all applicable local, state, national, and international laws and regulations in connection with your use of the CashStar Online Services. You further agree that you will comply with the export laws and regulations of the United States and any other country with jurisdiction over the CashStar Online Services, confidential information, intellectual property rights, or documentation or development tools of CashStar. The CashStar Online Services may not be resold, transferred, or otherwise disposed of, to any other country or to any person other than the authorized end-user, without first obtaining approval from the U.S. government or as otherwise authorized by U.S. law and regulations. PROPRIETARY RIGHTS. You expressly acknowledge and agree that, as between you and CashStar, CashStar owns all right, title, and interest, and does not transfer or assign any ownership or intellectual property or other rights, in and to the CashStar Online Services to you or anyone else, either expressly or implied. Accordingly, any unauthorized use of the CashStar Online Services by you may violate intellectual property or other proprietary rights laws as well as other laws or regulations. ©2017 CashStar Inc. and/or its licensors. All rights reserved. CashStar®, the CashStar logo, and all other names, logos, and icons identifying CashStar and its programs, products, and services are proprietary trademarks of CashStar, and any use of such marks, including, without limitation, as domain names, without the express written permission of CashStar, is strictly prohibited. Other service and entity names may be the trademarks and/or service marks of their respective owners. DISCLAIMER. WHILE CASHSTAR ENDEAVORS TO PROVIDE RELIABLE INFORMATION, SERVICES, PROGRAMS, SOFTWARE, AND MATERIALS, THE CASHSTAR ONLINE SERVICES ARE PROVIDED ON AN “AS-IS” AND “AS AVAILABLE” BASIS AND YOU ASSUME THE SOLE RISK OF MAKING USE OF THE CASHSTAR ONLINE SERVICES. CASHSTAR EXPRESSLY DISCLAIMS ALL WARRANTIES, EXPRESS OR IMPLIED, INCLUDING, WITHOUT LIMITATION, ANY WARRANTY OF MERCHANTABILITY, FITNESS FOR A PARTICULAR PURPOSE, OR NON-INFRINGEMENT OR ANY OTHER IMPLIED WARRANTY UNDER THE UNIFORM COMPUTER INFORMATION TRANSACTIONS ACT AS ENACTED BY ANY STATE. CASHSTAR ALSO MAKES NO REPRESENTATION OR WARRANTY THAT THE CASHSTAR ONLINE SERVICES WILL OPERATE ERROR FREE OR IN AN UNINTERRUPTED FASHION OR THAT ANY DOWNLOADABLE FILES OR INFORMATION WILL BE FREE OF VIRUSES OR CONTAMINATION OR DESTRUCTIVE FEATURES. You will be granted access to the CashStar Online Services using an individual account and access credentials. In connection with such access, you agree as follows: (i) you will create only one account for your use; (ii) all authorized user required information will be accurate, current, and complete information; (iii) you will keep all authorized user information updated and accurate at all times; (iv) you will keep your access credentials confidential; and (v) you will immediately notify CashStar if you (or the Company) discover or suspect that your access credentials or your Company’s or any of its vendor’s network security or systems have been compromised or breached. You will not permit any use of the CashStar Online Services that would damage, interfere with or unreasonably overload the CashStar Online Services. You acknowledge that CashStar will not contact you to solicit your user name or password. That if you are an authorized user acting on behalf of a company, you and the Company jointly agree that you each will be liable for all activities undertaken using your authorized user account, will be responsible for administering and managing access credentials, will immediately cease use and terminate access credentials if you no longer are an authorized user, and accept all risks for any unauthorized use of your access credentials. Unless you (or the Company) have notified us of any compromise or breach, you agree that CashStar should assume that any instruction transmitted using your access credentials is yours and has been authorized by you, and CashStar will be entitled to rely on such instruction. In furtherance of the foregoing, and not in limitation thereof, you and Company will cooperate with CashStar to respond to any compromise or breach and mitigate any potential losses, and will indemnify CashStar and its clients and their respective users for any losses or liabilities caused by or related to any use of any of Company’s authorized user account(s) or access credentials. You are responsible at all times for ensuring that your use of the CashStar Online Services complies with all applicable CashStar policies, including without limitation security, operational, financial, contractual, or similar business considerations, as the same may be updated from time to time by CashStar. CashStar reserves the right, without notice and in its sole discretion at any time, to suspend or terminate your (or the Company’s) access and use the CashStar Online Services, in whole or in part, in connection with any breach of this EULA, material failure to comply with applicable CashStar policies, or any known or suspected incident in which access credentials or network security have been compromised or breached, directly or indirectly; and to notify third parties of the same as required by contract or otherwise. LIMITATION OF LIABILITY. As a material condition to your use of the CashStar Online Services, each of you and the Company expressly absolve and release CashStar from any claim of harm resulting from a force majeure event. MOREOVER, IN NO EVENT SHALL CASHSTAR BE LIABLE FOR ANY INDIRECT, PUNITIVE, INCIDENTAL, SPECIAL, CONSEQUENTIAL, OR OTHER DAMAGES ARISING OUT OF OR IN ANY WAY CONNECTED WITH THE USE OF THE CASHSTAR ONLINE SERVICES, WITH THE DELAY OR INABILITY TO USE THE CASHSTAR ONLINE SERVICES, OR FOR ANY INFORMATION, SERVICES, PROGRAMS, PRODUCTS, AND MATERIALS AVAILABLE THROUGH THE CASHSTAR ONLINE SERVICES, WHETHER BASED IN CONTRACT, TORT, STRICT LIABILITY, OR OTHERWISE, EVEN IF CASHSTAR HAS BEEN ADVISED OF THE POSSIBILITY OF SUCH DAMAGES. BECAUSE SOME STATES/JURISDICTIONS DO NOT ALLOW THE EXCLUSION OR LIMITATION OF LIABILITY FOR CONSEQUENTIAL OR INCIDENTAL DAMAGES, THE ABOVE LIMITATION MAY NOT APPLY. NOTWITHSTANDING THE FOREGOING, THE TOTAL LIABILITY OF CASHSTAR FOR ANY REASON WHATSOEVER RELATED TO USE OF THE CASHSTAR ONLINE SERVICES SHALL NOT EXCEED THE TOTAL AMOUNT PAID BY YOU OR THE COMPANY TO CASHSTAR IN CONNECTION WITH THE SUBJECT MATTER OF THE PARTICULAR DISPUTE DURING THE THREE (3) MONTHS IMMEDIATELY PRECEDING THE EVENT GIVING RISE TO THE LIABILITY. INDEMNITY. As a material condition to your use of the CashStar Online Services, you (and the Company) agree to defend, indemnify, and hold harmless CashStar and its affiliates and all of their respective employees, agents, directors, officers, shareholders, attorneys, successors, and assigns from and against any and all claims, proceedings, damages, injuries, liabilities, losses, costs, and expenses (including reasonable attorneys’ fees and litigation expenses) relating to or arising from any breach by you of this EULA. GOVERNING LAW. This EULA has been made in and will be construed and enforced solely in accordance with the laws of the United States of America and the State of Maine, U.S.A. as applied to agreements entered into and completely performed in the State of Maine. You agree to waive any right to a jury trial in connection with any action or litigation in any way arising out of or related to this EULA and acknowledge that either party may seek attorney’s fees in any proceeding. Any claim you or the Company might have against CashStar must be brought within two (2) years after the cause of action arises, or such claim or cause of action is barred. CashStar makes no representation that the CashStar Online Services are appropriate or available for use in other locations outside the United States of America, and access to the CashStar Online Services from other states, territories, or nations where any aspect of the CashStar Online Services is illegal is expressly prohibited. TERM AND TERMINATION. This EULA, as updated and in effect from time to time, and your right to use the CashStar Online Services will take effect at the time you register for an account and each time you access or use the CashStar Online Services, and is effective until terminated as set forth below. CashStar reserves the right at any time and on reasonable grounds, which shall include, without limitation, any reasonable belief of fraudulent or unlawful activity or actions or omissions that violate any term or condition of this EULA, to suspend or terminate your access to the CashStar Online Services or to any portion thereof, without prior notice in the sole discretion of CashStar. You may also terminate this EULA at any time by ceasing any use of the CashStar Online Services, but the applicable provisions of this EULA will survive termination. The provisions concerning CashStar’s proprietary rights, indemnity, disclaimers of warranty, limitation of liability, and governing law, and Section 11 (Miscellaneous), will survive the termination of this EULA for any reason. MISCELLANEOUS. You agree that CashStar shall be entitled, in addition to other available remedies, to seek and be awarded an injunction or other appropriate equitable relief from a court of competent jurisdiction restraining any breach, threatened or actual, of your obligations under any provision of this EULA, and you waive any requirement that CashStar post any bond or other security in the event any injunctive or equitable relief is sought by CashStar. You may not assign your rights or obligations to any other person or entity without CashStar’s prior written consent. Failure by CashStar to insist on strict performance of any of the terms and conditions of this EULA will not operate as a waiver by CashStar of that or any subsequent default or failure of performance. If any provision (or part thereof) contained in this EULA is determined to be void, invalid, or otherwise unenforceable, such determination shall not affect the remaining provisions (or parts thereof), which will be modified to comply with applicable law in a manner that most closely matches the intent of the original language. No joint venture, partnership, employment, or agency relationship exists between you and CashStar as a result of this EULA or your utilization of the CashStar Online Services. Headings herein are included for convenience of reference only and are not intended to be used in the interpretation of the relevant provision. This EULA, as the same may be updated from time to time, represents the entire agreement between you and CashStar with respect to your use of the CashStar Online Services, and supersedes all prior or contemporaneous communications or proposals, whether electronic, verbal, or written, between you and CashStar with respect to the CashStar Online Services; provided, however, that this EULA is not intended to amend the terms of any existing agreement between Company and CashStar. © 2017 CashStar Inc. All Rights Reserved. Find food you love from local restaurants and chain favorites. Tap to place your order and pay with your Uber account. Track your food in real time from the restaurant to you. The ultimate steakhouse destination for food and wine lovers seeking a stylish, lively and memorable dining experience. Offering nationally renowned Prime beef and steakhouse fare, as well as an award-winning wine program, we believe that a steakhouse can be sophisticated yet comfortable and not overpriced. Offering authentic Italian cuisine passed down from the founders' family recipes, Carrabba's uses only the best ingredients to prepare fresh and handmade dishes cooked to order in a lively exhibition kitchen. Atom Tickets gift cards make the perfect gift for every occasion and for every movie lover! Atom Tickets is a movie ticketing app and website that allows you to buy movie tickets in advance, invite friends and skip the box office lines at thousands of theaters nationwide. Use Atom Tickets gift cards to purchase tickets for theaters including AMC Theatres, Regal Cinemas, Harkins Theatres, National Amusement’s Showcase Cinemas, Southern Theatres, Landmark Theatres, Bow Tie Cinemas, ArcLight Cinemas, Studio Movie Grill, Emagine, Megaplex Theatres, Silverspot Cinema and many others! Relax. Rejuvinate. Reward. Whether you already have a corporate incentive plan in place, or you are looking to introduce one, WaySpa can help make it a success. Reward your team members with the gift of relaxation and rejuvenation. Want to chat about a great corporate incentive program that can change the way people feel? No matter how big or small your next initiative might be, we’d love to help make life more relaxing. Bed Bath & Beyond® offers one of one of the largest selections of products for your home anywhere, at everyday low prices. The tremendous selection of merchandise includes bed linens, bath accessories, kitchen electrics, cookware, window treatments, storage items and much more! You'll always find brand names you know and trust such as Wamsutta®, Cuisinart®, Croscill®, Braun, J.A. Henckels, Oneida®, Krups, Mikasa, and All-Clad. Bed Bath & Beyond's Nationwide Bridal & Gift Registry is also available to customers online. Bloomin' Brands gift cards are the freshest way to see for yourself how one card can offer so many appetizing choices. From steak, seafood to classic Italian, Bloomin' Brands restaurants satisfy every craving. Our card can be redeemed at any of the following restaurants: Outback Steakhouse, Carrabba's Italian Grill, Bonefish Grill and Fleming's Prime Steakhouse & Wine Bar. One Card. So Many Options. That's exactly what eBay Gift Cards offer the recipient. Whether it's new, unique, or something in-between, eBay has you covered for any gift, any occasion, every time! Shop from millions of items in Electronics, Toys, Motors, Fashion, Home & Garden, Art, Collectible, and many more categories! Best yet, eBay Gift Cards never expire and have no fees. Use it to shop now. Discover a different nite out with Paint Nite! The social painting phenomenon that's entertained more than three million people, hosts thousands of events each month in more than 3,800+ bars across the globe. With its library of more than 13,000 paintings, all being original pieces of art specifically created for Paint Nite events, there's truly something for everyone! Worried about not being a good painter? Don't be! There’s no experience necessary—one of Paint Nite's 1,100+ artists will guide you step-by-step through the process. Since its debut in North America 20 years ago, Sephora has been a leader in global prestige omni-retail, inspiring clients to explore a universe of beauty and wellness, while creating the world’s most loved beauty community. With an unbiased approach to experiential retail through its expertise, innovation and entrepreneurial spirit, Sephora invites clients to touch and try 25,000 products from 400 carefully curated brands, enjoy personalized services at the Beauty Studio aided by digital innovations, and engage with expertly trained beauty advisors in more than 460 stores across the Americas, as well as 660 locations inside JCPenney. Clients can also experience Sephora online and through mobile apps, and access the free-to-join Beauty Insider program that offers unique rewards and experiences across three spending tiers. The Spafinder partner network is comprised of world-renowned retreats that pioneered the concept of Spa globally. Partners like Ananda in the Himalayas known for their Ayurvedic treatments which have been around for over 40 years. In addition, we have thousands of day spa and fitness partners who provide treatments throughout the United States. From week-long weight loss retreats to specialized day spa treatments such as massages, manicures, pedicures to haircuts and more. Designed to be the ultimate fan experience, the STARZ App lets you stream or download full movies and shows on your smartphone or tablet and watch them off-line, anytime, anywhere. That's premium entertainment you can take with you. Plus, STARZ is the home of ObsessableSM original series and hit movies. With over 7,000 titles to choose from each month, STARZ has you covered. Topgolf offers an upscale and playful experience, featuring an impressive food and beverage menu, music, games, complimentary club rentals and HDTVs. Whether it's a date night, girls' night, happy hour, work breakfast, lunch hour or any other kind of hour, Topgolf makes socializing a sport—literally. Players hit golf balls containing computer microchips that track each shot's accuracy and distance while awarding points for hitting targets on the outfield. You can challenge your friends and family to several different point-scoring golf games that anyone—from beginner to the golf pro—can play. Plus, with climate-controlled hitting bays, Topgolf can be enjoyed in all seasons. Happy Cards are the perfect reward or incentive for your customers and partners that can be used multiple times across the participating brands. Happy Cards provide the opportunity to add new brands not currently in your B2B program with competitive discounts and an easy online ordering portal. Go to Happycards.com to view all the options including: Happy Lady, Happy Guy, Happy Teen, Happy Kids, Happy Eats, Happy Dining. Baskin-Robbins creates innovative, premium hard scoop ice cream, a full range of beverages, and a delicious lineup of desserts including custom ice cream cakes, the Polar Pizza® Ice Cream Treat and take-home ice cream quarts and pints, providing quality and value to consumers. The Baskin-Robbins Gift Card is a convenient way to pay every day and can be redeemed at any participating Baskin-Robbins shop. Dunkin' is the world's leading baked goods and coffee chain, serving more than 3 million customers each and every day. We offer 50+ varieties of donuts, but you can also enjoy dozens of premium beverages, bagels, breakfast sandwiches and other baked goods. Introducing the Jamba Juice® gift card, the perfect way to share and enjoy a wide variety of premium blended smoothies, juices, bowls and juice shots. A Jamba Juice® gift card is the ideal low-denomination health and wellness offering with average product cost of less than $7 and redeemable in over 650 Jamba Juice® locations in the US. The Kroger Co. is one of the world's largest retail companies. It spans many states, many formats, and operates under nearly two dozen banners. buybuy BABY® offers a huge selection of merchandise for newborns and toddlers, from all the best brands at everyday low prices. At Christmas Tree Shops andThat!, we know what you are looking for: stylish home decor for every day, every season and every holiday; patio and garden essentials to create your own great outdoor space; the best party supplies, decorations and favors for your next celebration. One Kings Lane helps their customer make their home an expression of their personal style. Content she loves that encourages her to create a beautiful home. One destination for high-quality furnishings across a range of brands, categories, price points, and aesthetics. Outback Steakhouse, an Australian-inspired restaurant is internationally known for award-winning steaks, the Bloomin' Onion and a wide variety of chicken, ribs and seafood. The warm, inviting and casual environment is perfect for coming together to enjoy a good, wholesome meal. 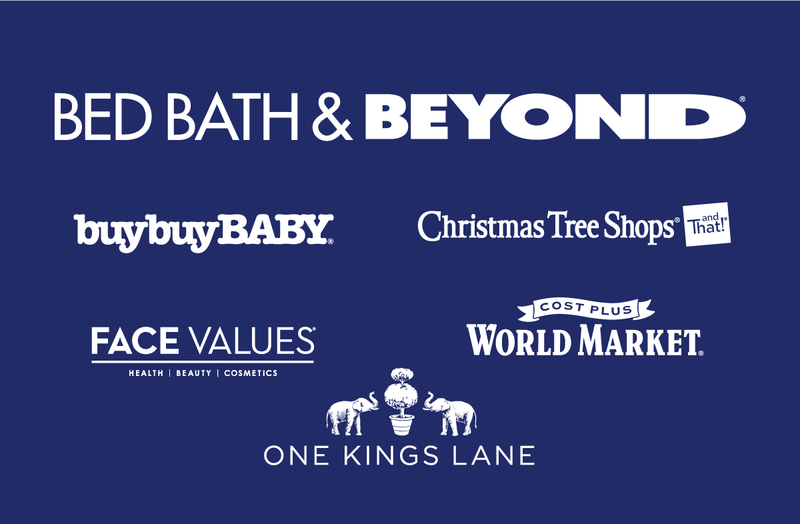 Bed Bath & Beyond Inc offers a wide selection of domestic merchandise and home furnishings, at competitive prices, across multiple brands: Bed Bath & Beyond, buybuy Baby, Christmas Tree Shops andThat!, Cost Plus World Market, Harmon Face Values, and One Kings Lane. Bed Bath & Beyond brands are the trusted experts for home and "heart related" events such as getting married, moving to a new home, having a baby, going to college, and decorating a room. All of which is supported with wedding and baby registries, new mover and student life programs, as well as design consultation services. Known as the "fresh ﬁsh experts," Boneﬁsh Grill specializes in market-fresh ﬁsh from all over the world. They offer an innovative, seasonal menu and specials that feature the highest-quality, freshest ingredients. Expect a polished, casual experience with a big-city bar that offers bar fresh cocktails and an affordable, interesting wine list that are designed to indulge your senses, regardless of the occasion.